Rotational rheometry is a powerful analytical technique for measuring/comparing the viscosity, viscoelastic properties (e.g. G’, G”, tan δ), crosslinking, molecular weight and transient properties (e.g. creep, modulus) for a wide range of samples including fluids, semi-solids, and solids. The term rheology is defined as the study of deformation and flow of a material. 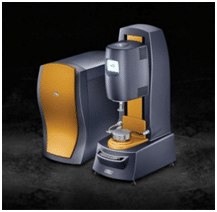 During analysis with a rheometer, the sample is placed in a controlled geometry and subjected to a controlled stress or strain and the corresponding strain/rotation or stress/torque is measured respectively. The analysis can be performed using a versatile number of system accessories that allow for customization of heating and ramping control, solvent trapping, plate geometries (cone, parallel, etc), and other method conditions which can be tailored to your specific sample requirements. The rheological characteristics of the sample is then be measured by rotating, oscillating, or applying a step function and measuring the resulting torque, angular displacement, or angular velocity.Rotational rheometry is an excellent tool for discerning material properties, extent of crosslinking, stability, molecular weight and compliments traditional viscosity or mechanical measurements.